When the talking heads on the internet starting carrying on about Amazon Prime day, I had to think about it. Because the regular 122S version of the Amazon isn't prime...but then I remembered the 123GT version...which is ALMOST prime, but it is divisible by 3 & 41, which are both prime numbers and in nerd speak we call it semi-prime or biprime. Anyway, I don't need any worthless electronic devices littering my house and listening to my private conversations (how long before the thought police start to use Alexa/Siri to find non conformists and turn them into Soilent Green...huh? 10 years? 20 -- whoa, who let Vince off his meds...quick distract him with some Saab Inca alloys and hit him with an injection of fluoride...aggggg...we now return to our regular programming), but I do need a classic Volvo. Find this 1967 Volvo Amazon 123GT offered for $2,500 in Seattle, WA via craigslist. Tip from Zach. 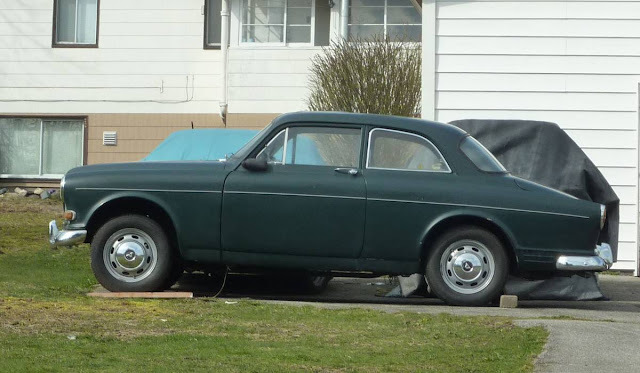 1967 VOLVO 123GT restoration project, US$2500 (it is a rare sports version of the 122S Amazon), Dark green exterior, tan interior. 3rd Owner. This is a Canadian made 123GT with limited slip differential, Recaro reclining seats, Dash with change tray and tachometer, GT steering wheel, 123GT trunk emblem, M41 4spd transmission with overdrive and adjustable Koni shock absorbers. The car has no accident damage, is very straight and is a good restoration candidate. It has been in storage for 20 years following an engine failure. The car's all important sub-frame is very sound and the car is rolling. It will need paint and bodywork with lots of areas of rust to repair. The trunk lid has rust along the bottom and should be replaced. All other body panels are fixable. It has an aftermarket sunroof. The floors have been coated in fibreglass instead of addressing each rust spot. It is sound, but not the best solution. 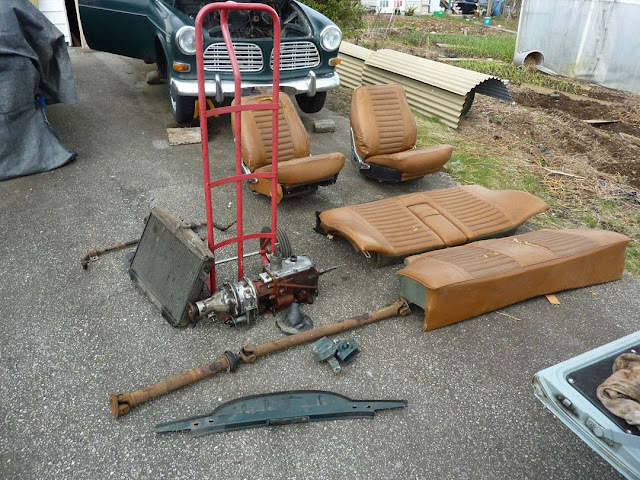 It comes with all the parts shown in the pictures + a disassembled B20B engine. It will make and excellent 123GT. Porsche 997 (6th-generation "911" Carrera and Carrera 4 from 2004–2011 Confused yet? Oh how about a 409? Or anything with a Chevy 283, Chevy 307 Pontiac 389, AMC 401, Chevy 409, that's enough, the dog has to go on a pee run. Vince, just cover the "2" in 123. But 122 is also semi-prime.